Look at these beauties! 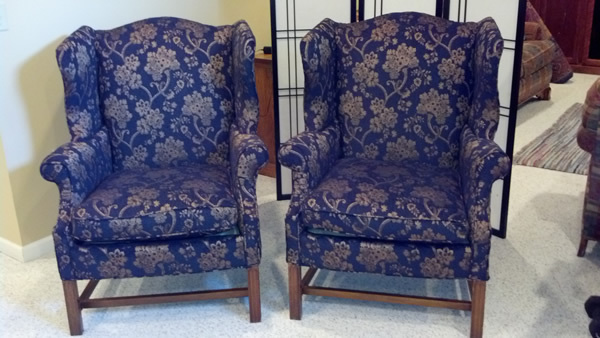 We are so proud of these re-upholstered wing back chairs project. These wing back chairs make a great statement in a formal living room or family room. These beautiful wing back chairs came all the way from California with their owner. Newly married, she wanted an updated look. This was a challenging project not only to upholster a wing back chair, but to make them identical. I also added new Dacron to fluff up the cushions of the chair to add to the comfort.